The disaster was famous because the ships went down laden with cargo and left Portugal's trading outposts open to an attack by Indian forces. In 1998, archaeologists surveyed the area where the ships were thought to have sunk and found what looked to be a wreck site. It wasn't until 2013, however, that the Oman government and researchers could arrange an excavation in the remote area. Over the next two years, archaeologists recovered almost 3,000 artifacts from the site, including a ship's bell inscribed with the year 1498. The astrolabe was found under 1.3 feet (0.4 meters) of sand in a natural gully near the wreck site. The artifact measures 6.9 inches (17.5 centimeters) in diameter and is festooned with the Portuguese coat of arms and an armillary sphere — a representation of the position of celestial objects around Earth. (The armillary sphere was a common Portuguese emblem and is still part of the country's flag.) The metal used in making the astrolabe is an alloy made mostly of copper, with a little zinc, tin and lead. 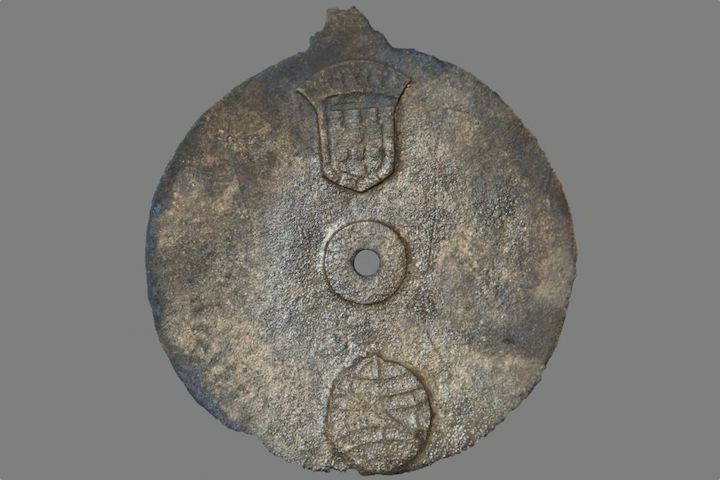 A 3D-laser scan of the astrolabe reveals tiny, eroded-away etches in the top right quadrant that would have allowed navigators to measure the altitude of the sun or stars to determine their ship's latitude. Years of damage by saltwater and tides erased most of the other markings on the astrolabe. To uncover what could no longer be seen by the naked eye, researchers at the University of Warwick in England used laser scanning to detect the tiniest grooves and etchings on the disk. 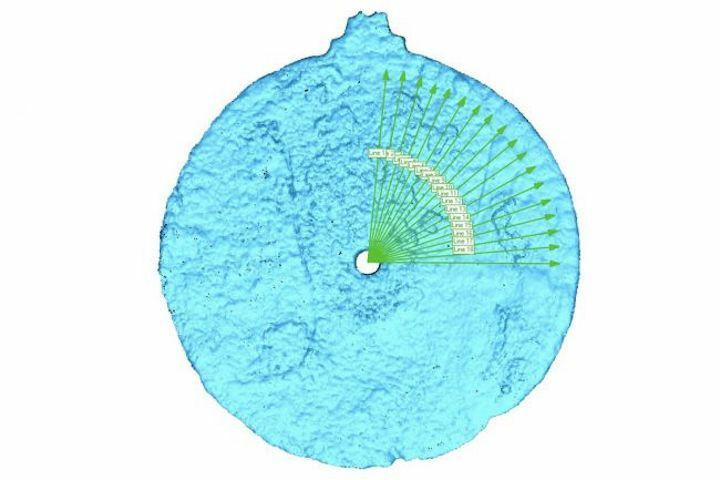 Their results, published in the International Journal of Nautical Archaeology, revealed 18 scale marks on the upper right of the disk, which would have allowed the navigator to measure the angle of the sun or stars. The first recorded use of an astrolabe was on an expedition by a Portuguese explorer in 1481, the researchers wrote, but the earliest versions were likely wood and did not survive the ages. The Sodré astrolabe had to be made before February 1502, when the squadron left Lisbon. The armillary sphere was an emblem of Dom Manuel I, the king of Portugal from late 1495 to 1521; the astrolabe was probably manufactured during his reign, at around 1496 at the earliest, the researchers concluded. The 1498 ship's bell and the dates of coins found at the wreck site all support that date range, they wrote. According to the University of Warwick, that ship's bell will also be taking a place of honor in the Guinness World Records as the oldest ship's bell ever discovered.